Maintaining a relationship with your client’s is essential to your business, this post will give you some great email marketing ideas to grow your email list, the best way to stay in touch. An email list is still the best way to find qualified leads for your business. Even with the growth of social media and other forms of communicating with potential clients, the email list remains the most stable and best way. Followers or likes on social media are great, but you still don’t own that, same with subscribers on YouTube. If you don’t own the communication medium, there is always potential that connection with your audience could go away, or be more challenging to reach. Consider Facebook, it used to be easy to connect with your own audience, now you are estimated to reach a meager 2.5% of your audience organically. To reach more, you must pay for it. Your email list will always stay the same cost to reach your customers, and your emails will (almost) always make it to their destination. If you don’t already have an email list for your business, you should immediately start one before you do anything else. I use MailChimp and have been very satisfied with it but you’re welcome to use any that works for you, AWeber is another popular one. I prefer MailChimp partly because it ties in well with WordPress and partly because there are so many great plugins for it. I’ll broadly cover the 8 tips to grow your email list. In the coming months, I am expanding on each one though, as I write posts I will link to them. These tips will help you grow your email list by putting your sign up wherever clients are. You’ll find these are some of the greatest ways to grow your email list, hence the great. I could give you a lot more, but the reality is many of them aren’t that great. I will be writing over the next few months on each of these tips specifically. There are many intricacies and I want to be sure those are all available. Give something to your visitors, and it has to be something good. You can’t expect to hand over access to a blog post and get subscribers. You have to give something great, and it has to look great too. People are visual beings and we want to see what we’re getting is cool/valuable. It needs to look like time was put into creating it while also creating high value. You can also offer a basic level of your normal service, this could be extremely valuable to a potential subscriber. You can find a more expanded version of this tip in the post What To Offer To Get New Email List Subscribers. Everybody likes to save money on something they were already going to buy. Right? If the offer is compelling enough the answer is certainly yes. A new customer may be more tempted to complete their order and you’ll gain a new subscriber to stay in contact and potentially make further sales down the road. Coupons for signing up are a win-win because you get a valuable new subscriber and the customer gets a discount on something they were already going to buy. If they weren’t already going to buy, a savings of 20% is sure to change their mind. You can also learn more about using coupons as a way to grow an eCommerce email list. Most people love winning stuff. It’s not only a great feeling to win something, but it’s nice to get something for free too. 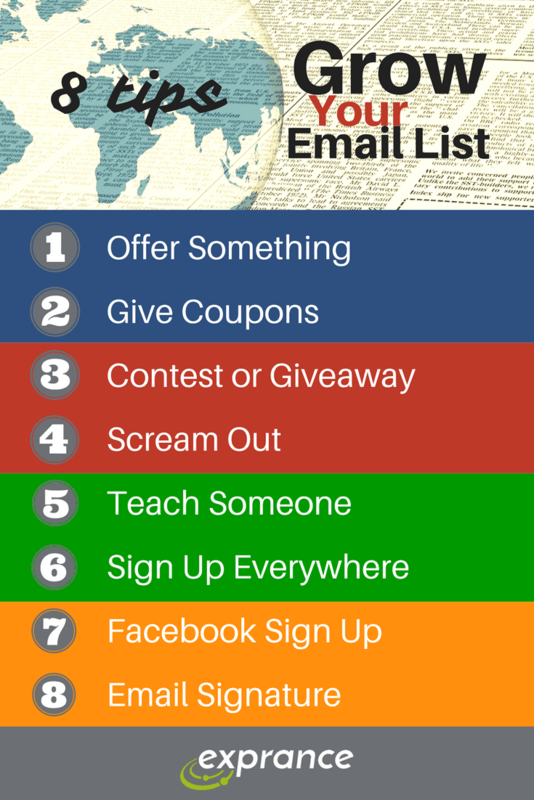 If a contest or giveaway is executed well, a lot of qualified leads could come pouring into your email list. There are a lot of different ways to run a contest or giveaway, including social media, but enabling those entering to subscribe to your email list is a great way to make connections with potential new customers. If you have a physical or digital product you can give away, you may be able to benefit by getting a lot of your target audience members into your email list. Here are some ways to effectively go about it. You probably don’t want to really scream to your visitors, but the equivalent on a website is a slide-up or pop-up. You saw one on this page (if you’re reading on the website) and it wasn’t too intrusive but it did draw your attention I bet. There is a fine line to walk between being intrusive and drawing attention, though. Some people don’t like pop-ups and will immediately leave, but they’re usually the outspoken minority. Most visitors find a reminder to subscribe helpful if they’re interested in the content and if they’re not, it’s easy to close. I’ve expanded this post into the 4 ways to tell website visitors to subscribe. 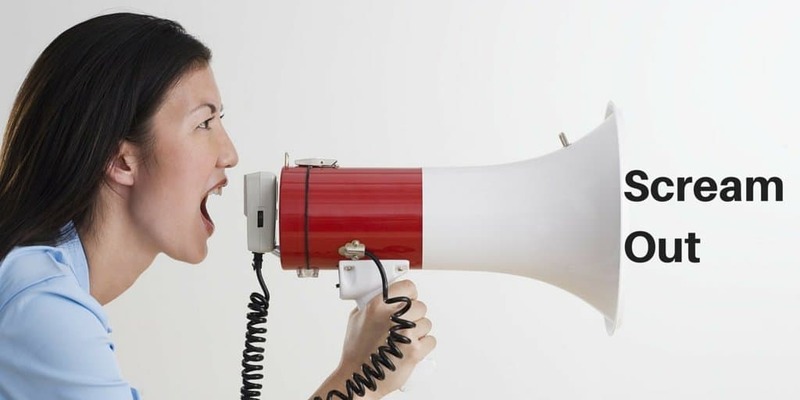 It covers the different ways you should be screaming out to your visitors to catch their attention. Most people are hungry to grow their skills. Most people wouldn’t hesitate giving up their email address to sign up for a webinar or some other free way to grow professionally. You’re the expert in your field and offering to teach some of that is not only generous, it gives something of value to people that they are willing to trade their email address for. These are highly qualified leads who are interested in your topic but may not have the time or skill to do what you can. They’re the perfect candidate to keep in touch with. Sharing your skills with others will also help you grow your email list and your business. Every form on your website should have an option to sign up for your email list. Don’t push it in visitors faces by having it selected by default, but offer it as an option. You’ll notice each form on this website has options to sign up for the online presence newsletter. Here are some of the forms you’ll find the option to subscribe on: contact form, comment form, quote form, and landing page forms. This is one of those reasons I like MailChimp, there is a great WordPress plugin that lets you add this selection to any form on your site. For more information on this tip and how you can put sign-ups on every form, I wrote this article with some helpful links and WordPress plugins that will help you. Surprising as it sounds, you can even have a signup form for your newsletter on your Facebook page. A new tab can be added to a Facebook page which provides your fans a way to subscribe to your newsletter. It’s a quick way to get subscribers without making them leave Facebook. Even if you don’t have a website you can use this method to get subscribers and own your contact with customers. You’ll never have to pay to reach your customers this way. If you’re using MailChimp then it’s easy to integrate, in this post, I cover how the integration looks and how you can do it too. Take a moment to think about how many emails you send and receive in a day. Even if you’re not the biggest fan of email, I bet a lot of emails fly back and forth. Make a compelling email signature line that urges people to sign up for your newsletter. If it sounds interesting, people will want to check it out. I provide an example of my signature line in this post where I expand on this tip. You’re now equipped with 8 great ways to grow your email list. Though, getting subscribers isn’t the hard part believe it or not. Reaching them in their crowded inbox is the biggest challenge. One way you can help mitigate this challenge is to collect more than an email address. There is a fine balance between collecting too much information and collecting too little. Too little information leads to lack of personalization in your emails which are more likely to end up in the spam folder or worse, comes across as inauthentic or robotic, ouch! Reaching your subscribers in their inbox is great too, but that’s still not enough. Even if you get subscribers, if your content in your newsletter isn’t high quality and useful, you’ll quickly have a unsubscribe. Create value for your subscribers and build trust over time. Your newsletter is a great way to show your ability, and build your brand at the same time. You can’t do this by talking about yourself, though. Your newsletters should give value to the subscriber. Telling them about your organization and what you do isn’t valuable to subscribers. Help them do something, learn something new, or give them something to think about for their own benefit. A newsletter isn’t a place for you to be self-serving, it’s a place to serve the subscriber. You have to deliver something of value or capture your audience’s attention somehow to get subscribers to your newsletter. Just because it’s free doesn’t mean it’s going to be valued by your audience. It has to be good, and it has to deliver more value to your audience than an email address does to you. You’re now equipped with 8 great tips and the motivation to go out there and grow your email list. Happy email list building and as always, for more great tips and info subscribe to the online presence newsletter.